What would you expect from a talk about the future of waste hosted by a city that’s proud of its sustainability credentials, promotes zero waste, is working on a program to divert all organic waste from landfill, and is trying to push through a local ban on plastic bags? You’d expect a discussion on reducing waste at source, closed loops systems, community education programmes, better recycling facilities and the role of entrepreneurs in repurposing waste, surely? You certainly wouldn’t expect to hear the case for building new incinerators as the solution to the waste problem, would you?! Looking at the poster, I certainly didn’t. I was expecting an interesting discussion. What I didn’t know beforehand was that both Phoenix Energy and New Energy have applications in Perth for constructing incinerators, in Kwinana and Rockingham respectively. Not only that, but the Major of Fremantle has just come back from a trip to Japan to visit these plants, and was clearly impressed by the technology. 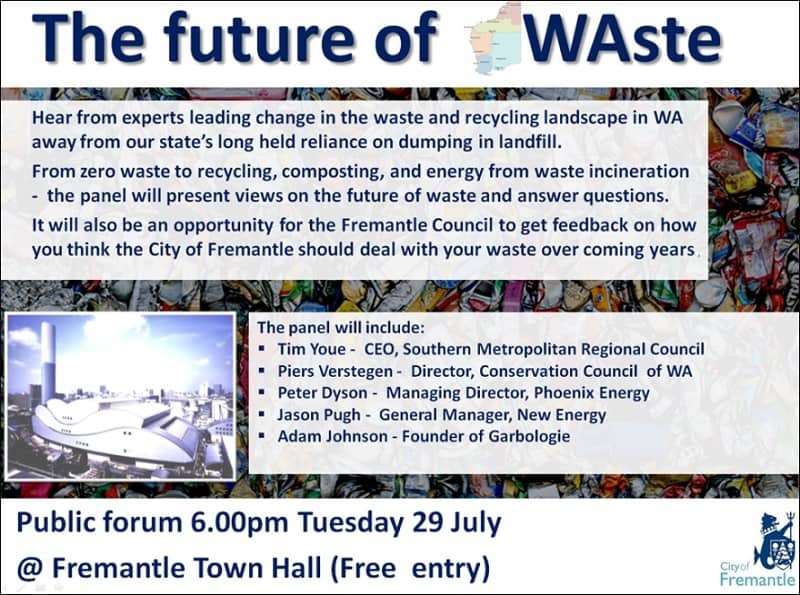 So what was billed as a talk about the future of waste for Perth and Fremantle became a talk about the role and benefits of incinerators, and descended into a slanging match between the pro-incinerator PR guys and the anti-incinerator community members. One of the original speakers had cancelled at short notice, and was replaced with Lee Bell from the National Toxics Network, who made the discussion far more balanced than it otherwise might have been as he was able to talk credibly about the issues incinerators have caused (and continue to cause) globally. Before I watched Trashed, I had some idea that incinerators were bad. After that, my views were very firm and clear. Even so, it wasn’t meant to be a discussion about incinerators…it was meant to be a discussion about the future of waste, and how to make it more sustainable! I wasn’t there to be convinced of the need for incinerators, I was there to hear ideas and solutions, new ways of doing things, how to make this idea of zero waste a reality. How to educate the public and look at changing behaviours. Positive solutions that don’t encourage wasting resources by turning them into (toxic) dust, but return them into useful production. The Kwinana waste-to-energy plant (the more politically preferable name for an incinerator) is going to cost $380 million to build. Imagine if all that money, that $380 million, was invested in real green energy technology such as solar and wind, sustainable cradle-to-cradle product design enterprises, community waste education programmes and imaginative waste entrepreneurs who repurpose waste?! Instead, the plan for the future is to take all that material, and turn it into (toxic) ash. Is this really the future of waste? ← The Last Day of Plastic Free July…and a Debrief! How bloody horrible. It gets so depressing. Why can’t they get their heads out of the sand? Grrrrr. I try not to think too much about all the stuff I have no control over, but I really thought this talk would be engaging and inspiring. Grrr from my end, too! At first I was sad to hear that the meeting focussed on incinerators. Then I thought, great, you know what’s coming and what’s being planned, you can organise the community against it. You just need to convince a majority of councillors that it’s a bad idea and an incredible waste of money and resources. Then, it won’t matter what the mayor thinks our what thee energy companies do. It just won’t get passed. The sad thing was that both of the incinerators talked about HAVE been approved by the EPA (the Environmental Protection Authority), and one has planning permission too. I think if Fremantle try to build another they will face a heap of resistance, but neither of the proposed ones are that far away. I would have been similarly disappointed and felt my time had been wasted. I don’t see incinerators as the answer to waste nor do I think they will last. When I think of the future of waste I see a closed loop system and programs similar to what past generations had such as the rag pickers who came to collect fabrics that were no longer of use. I also see repurposing becoming a big part of our way of life. Rather than tossing old clothes and worn blankets, quilts will be made from them, such as i already do. 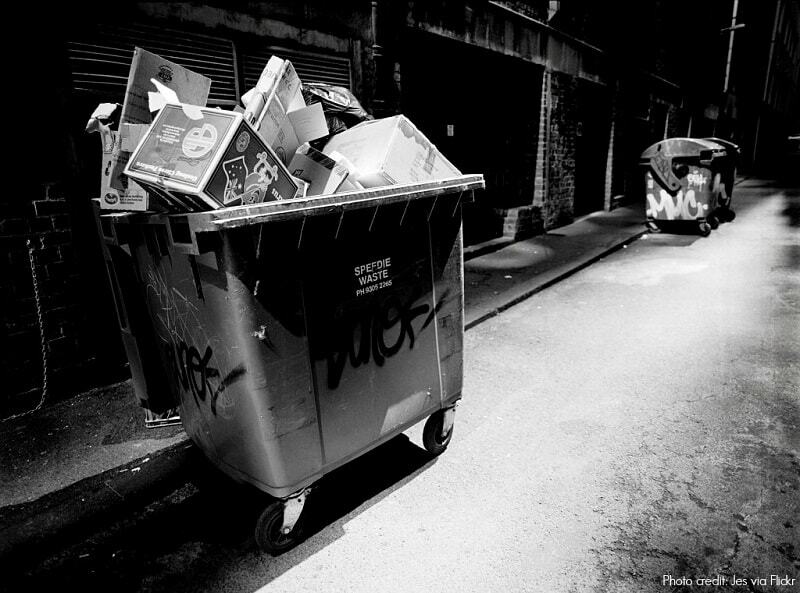 The future of waste will be to have little of it. I hope that happens – a return to what we know works from past generations. My impression is that in the UK things are going more that way – there seems to be a revival of thrift and vintage and making do – but here in Australia it doesn’t feel that way. I really need to invest in a sewing machine! I find your comparison between the UK and Australia to be different from what we in the US hear about. Our impression from the news is that Australia is much more aware of environmental issues and more progressive. I hope you find a sewing machine, it’s something you’ve been thinking about for a while now. Oooh just thinking about it makes me angry! Right, think sewing machine thoughts. That calms me down! Yes, that’s something I will get by the end of the year! How horrible. How much longer will he be in office? I had heard about the barrier reef as a transport path but negative news about Australia doesn’t hit our news often. Too long. I think 2 more years. I haven’t seen the movie “Trashed” but I have heard of it, and am trying to find a used copy somewhere. I am currently reading a book titled “THE ZERO WASTE SOLUTION” by Paul Connett with a foreword by Jeremy Irons (who obviously starred in “Trashed”). The book was only published last year, and perhaps the politicians in WA haven’t had a chance to read it yet! Clearly to some of us, burning our waste and instantaneously producing carbon dioxide is not the answer to reducing our carbon dioxide emissions. Not to mention the fact that valuable resources are being utterly wasted by being incinerated, and the need to replace these resources to make more stuff wastes more energy and contributes more to global warming. A quote from the book…….”Discarded materials are not waste until they are wasted. Waste is a verb, not a noun.” What’s happened to a clear vision for zero waste that involves a closed loop system? “Waste is a verb, not a noun” I love that! My library doesn’t have that book (I just checked). Our WA politicians really couldn’t care less about the environment, sadly. Thy are the ones who instigated the ridiculous shark cull, amongst other things. Ooooh, a chapter on fighting incineration proposals?! Sounds like I should read that! I might go harass my library and see if I can get them to stock some of these books you’re constantly recommending…I feel like I’m missing out! Scratch that – I AM missing out! Yes, the DVD thing would be frustrating! We have a couple of great community organisations/sustainability businesses near us that show screenings regularly. But I don’t know many readers of books! It appears that San Francisco leads the way when it comes to the zero waste journey. By 2000 it had achieved 50% waste diversion. This has increased to a whopping 80% waste diversion by 2012! This is a higher waste reduction than can be achieved WITH incineration (which is only 75%)! In addition, San Francisco’s major recycling plant is a private employee-owned company called Recology, that employs over 1000 unionised workers! More info on San Francisco’s culture of Zero Waste can be found on GAIA’s website. I know that one of the big criticisms of incinerators is that they don’t create jobs/employment, whereas recycling creates lots of jobs. Trashed talks a lot about San Fransisco’s waste management and how progressive it is and how successful. I wish the Fremantle Mayor had visited there rather than Japan! Japan is interesting because according to Connett, at one stage Japan had 1,800 incinerators in operation (3 times more than the rest of the world combined). But by 2006 it appeared that industry was leading the way toward zero waste with 2,800 businesses adopting a zero waste as a goal and that 99% had reported that they had achieved zero waste to landfill, and 34% said they achieved zero waste to incinerators. So its a bit of a mixed bag! 8. Residual separation and research facilities.